Since the introduction of in vitro fertilization (IVF) in clinical practice of infertility treatment, the indicators for high quality embryos were investigated. Cumulus cells (CC) have a specific gene expression profile according to the developmental potential of the oocyte they are surrounding, and therefore, specific gene expression could be used as a biomarker. The aim of our study was to combine more than one biomarker to observe improvement in prediction value of embryo development. 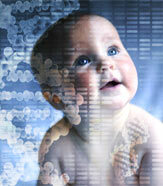 In this study, 58 CC samples from 17 IVF patients were analyzed. This study was approved by the Republic of Slovenia National Medical Ethics Committee. Gene expression analysis [quantitative real time polymerase chain reaction (qPCR)] for five genes, analyzed according to embryo quality level, was performed. Two prediction models were tested for embryo quality prediction: a binary logistic and a decision tree model. As the main outcome, gene expression levels for five genes were taken and the area under the curve (AUC) for two prediction models were calculated. Among tested genes, AMHR2 and LIF showed significant expression difference between high quality and low quality embryos. These two genes were used for the construction of two prediction models: the binary logistic model yielded an AUC of 0.72 ± 0.08 and the decision tree model yielded an AUC of 0.73 ± 0.03. Two different prediction models yielded similar predictive power to differentiate high and low quality embryos. In terms of eventual clinical decision making, the decision tree model resulted in easy-tointerpret rules that are highly applicable in clinical practice.